Master 1817 - Tape 2 Text: "...kill devil hill, kitty hawk, December 17 1903 Orville Wright flew the first heavier than air machine...the world scoffed, but the Wrights struggled on. After years Wilbur Wright made the first flight in Europe flying under French government subsidy...Orville Wright won the $30,000 prize at Fort Meyer, Va for a sustained flight with a passenger..." MCU U.S. President WILLIAM HOWARD TAFT and ORVILLE WRIGHT AND WILBUR WRIGHT. Master 3 - Tape 1 Republican bachelor president William Howard Taft shakes the hands of some military personnel. He then stands at a podium and starts reading from a prepared speech. William H Taft, a statesman for history, pictured at his summer home at Murray Bay, Canada. William Taft sitting on a lawn with his family. The august statesman is just Grandpa here. William Taft with his family on the front porch. Child climbs into his lap. Various city street scenes 1910. Horse-drawn carts in very muddy street. VS pedestrians struggling against a very strong wind. Blizzard in city. Wind blowing so hard it blows people sliding along on icy street. Automobiles driving on wide boulevard, street. 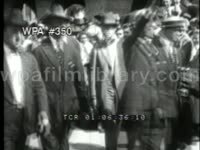 VS President William Howard Taft - -shaking hands, making speeches. March 4, 1913, Inauguration Day, high angle LSs of military parade through the streets of Washington DC, some shots w/ Capitol Dome in BG. MS President William Howard Taft in office, looking over documents. Recreation CU Taft signing legislation. William Howard Taft shaking hands with two Caucasian women. President William Howard Taft speaking at outdoor rally, shaking hands from gazebo. The Innocent Years - Part Two. 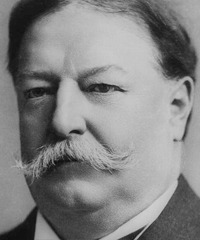 Taft Presidential Campaign. DO NOT SELL Voiceover. The Innocent Years - Part Two. Taft Presidential Campaign. MSs U.S. President WILLIAM HOWARD TAFT playing golf at a private course. (note that the President's caddy is an African America male teenager.) MSs William Howard Taft speechifying, shaking hands with constituents. MSs Democratic Presidential candidate WILLIAM JENNINGS BRYAN speechifying, campaigning. MSs President Taft and entourage on Inauguration Day, making way to (or from) ceremony. 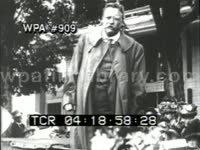 MSs Mr. Taft reviewing papers in a dim office. President William Howard Taft on campaign trail. 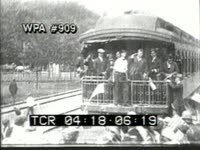 Taft speaking from caboose of train. 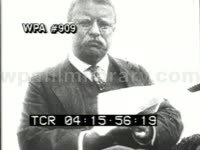 Taft orating at rally, reading from script. Taft shaking hands of constituency from gazebo. 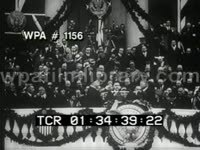 TLS Chief Justice WILLIAM HOWARD TAFT administering Oath of Office to Calvin Coolidge, March 4, 1925. MS/CUs famed attorney & politico WILLIAM JENNINGS BRYAN exiting building, tipping hat. 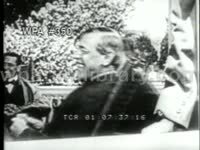 Supreme Court: CU Chief Justice of the Supreme Court WILLIAM HOWARD TAFT wearing fedora, smiling, posing. MS Chief Justice CHARLES EVANS HUGHES posing, removing hat. CU Justice OLIVER WENDELL HOLMES, JR. posing for cam. Panning wide MS Supreme Court Justices of the United States under the Hoover administration (Charles Evans Hughes, Oliver Wendell Holmes, Willis Van Devanter, James McReynolds, Louis Brandeis, George Sutherland, Pierce Butler, Edward Sanford, Harlan Stone).